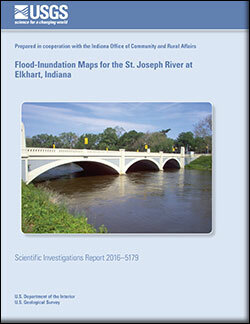 Flood inundation maps (FIMs) translate the stage of a river (shown on a hydrograph) to a map showing the extent and depth of flood waters. FIMS are created by combining datasets calculated by hydraulic models with ArcGIS, a geographic information system. FIMs can be used in conjunction with USGS real-time data and National Weather Service Flood Forecasts to plan and prepare for flood events. 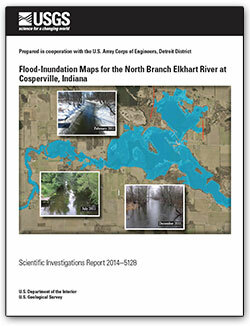 FIMs are part of a library which includes high-resolution maps, a technical report describing the method of creating the FIM, GIS layers, and the USGS FIM Online Mapper. 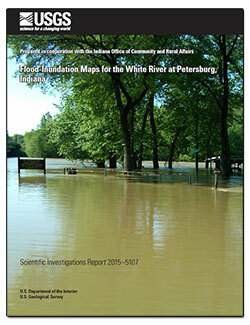 Floods are the leading cause of natural-disaster losses in the United States. 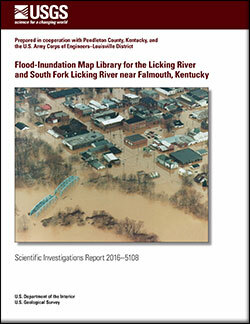 The USGS Flood Inundation Mapping (FIM) program focuses on developing FIM libraries for communities across the country. 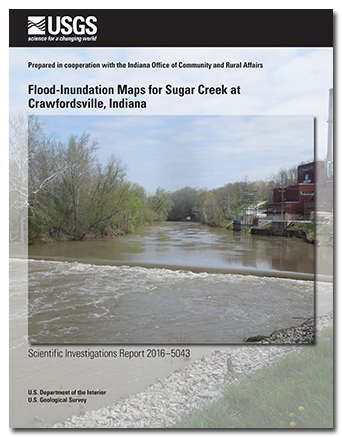 USGS and the National Weather Service (NWS) are helping keep these communities safe from flood waters by combining FIM libraries, real-time streamgage data, and NWS flood forecasts. More than 75 percent of declared Federal disasters are related to floods, and annual flood losses average almost $8 billion with over 90 fatalities per year. Although the amount of fatalities has declined due to improved early warning systems, economic losses have continued to rise with increased urbanization in flood-hazard areas. 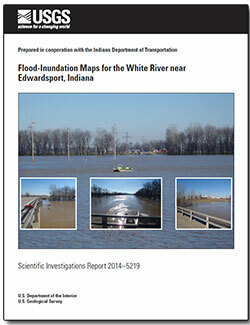 By using FIM libraries, real-time streamgage data, and NWS flood forecasts together, communities can estimate the extent of forecasted flooding and take steps to mitigate flood risks. We develop FIM libraries that show the extent and depth of flooding at specific water-level (stream stage) intervals along an section of a stream or river. While historical flood observations are important, FIMs are created using hydraulic modeling which allows users to visualize a much wider range of flood scenarios. We operate streamgages throughout Indiana, and the U.S., that provide real-time data about water levels (how high the water is at that moment). Our real-time data is collected, checked, and stored in the USGS National Water Information System (NWIS) and is available to the public through NWISweb. 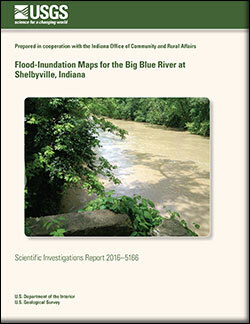 NWS provides flood forecasts at roughly half of all USGS streamgages: A flood forecast is an estimation of how high flood waters may rise. 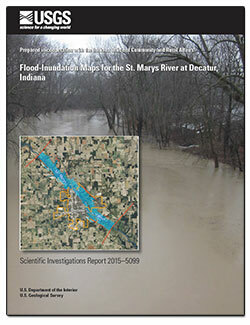 Flood forecasts are developed with local hydrologic models and typically provide forecasts up to several days before the flood impacts the area. 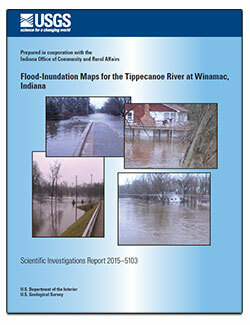 Once a flood has been forecasted, local officials and the public can interact with the FIM for their location through the USGS Flood Inundation Mapper. 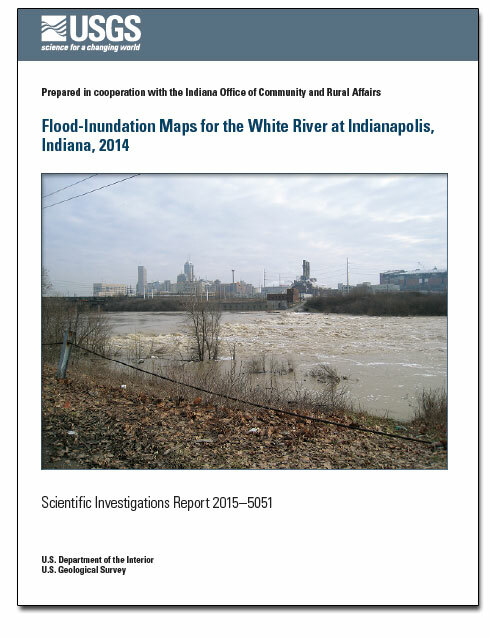 The Flood Inundation Mapper is an interactive, online mapping application that shows the estimated extent of flood waters on a map at various water levels. Site Selection and Data Collection: stream gage datum elevation; historic flood peak information; stream gage rating curve; high-water mark data; historic flood profiles; FEMA flood insurance study (FIS) materials; existing hydraulic models; existing AHPS text descriptions of the local impacts to property, structures, and roads; and topographic/bathymetric data. Hydraulic Modeling: selected for each study, generally is a one-dimensional step-backwater model developed by the U.S. Army Corps of Engineers. Geospatial Processing: water-surface profiles from the hydraulic model and digital elevation model (DEM) data are combined in ArcGIS, a geographic information system. 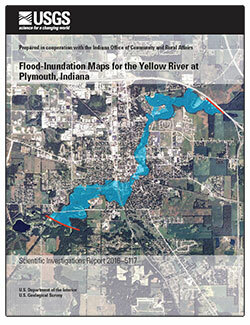 Map production: GIS layers from step 3 are combined with base map layers to form the indundation maps. 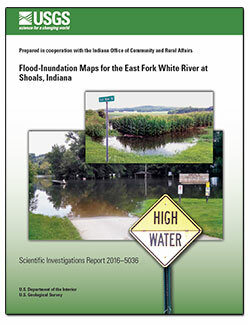 All of the Indiana and Kentucky FIM libraries can searched throug a map interface or list of available FIMs on the Flood Inundation Web Site.